Once you just start living in the new places or you just visiting it for the first time, you must dedicate at least one weekend and live it as a tourist. In this blog post, I will talk exclusively about places which you must visit and later show to your friends and relatives who come to visit Malaga for the first time in the near future. Wouldn’t it be amazing to start your touristic weekend experience from food? I think you should definitely check if love in this case for Malaga comes from the happy stomach. For the first late evening, I would suggest visiting El Pimpi, probably the most famous restaurant and winery of Malaga. Here you should grab few different dishes to try various things at the same time. You can choose from different types of toast, meat and cheese dishes, as well as different kind of fishes and seafood. Vegetarians will also won’t be left with an empty stomach. You have a variety of salads as well as Spanish-style potato omelet and few other options to choose from. To add up to the nice food I would strongly suggest trying at least one glass of sweet wine called Moscatel. It is one of the best known sweet wines of Spain and it is just a must for the tourist to try it at one of the oldest and most known wineries of Malaga. In order to continue your amazing Friday evening, you should head towards one of the terraces of Malaga. Rooftop Terrace of Alcazaba which is just around the corner of Pimpi would fit perfectly! Here grab some cocktails sit down and enjoy the incredible view of Alcazaba. The terrace most likely will be super crowded as it is always like this during the weekend. If you are looking for some more relaxing place check La Marine Lounge. It is based in the heart of Real Club of Mediterraneo which is next to the sea port of Malaga. Choose the table close to the water and get the sensation of you being in the ship. In addition to this unique atmosphere, you will be able to enjoy Malaga from a sea point of view. Entire Malagueta, castles of Alcazaba and Gibralfaro will be nicely placed in the landscape. If you are still up and going, you have a desire to live the night life of Spanish people, visit one of the clubs, so called fiestas of Malaga. Liceo probably would be one of the best places to choose from. Inside you will get a feeling of being in a big old fashion two stores house were a loud and different type of music is playing downstairs and upstairs. So I am sure that one of those floors will make you to stay and enjoy some night time of Malaga. Please note: Don’t be super late! Although night time in Spain Start significantly later (around 1 am or 2 am) than for instance in England, Liceo gets full very quickly. If you will come a bit earlier, you will avoid waiting in the que to get in and also the charge for entrance. Dancing till 7 am in the morning if you survive that long should get you pretty exhausted and ready to go to finish the first day in Malaga. There is nothing better than to start your Saturday with delicious breakfast, good coffee or freshly pressed juice. What if I would say that this could be combined with the beach? Yes, you can do that while being on the beach! My favourite place to start my Saturday or Sunday is Chiringuito La Farola. The chiringuito is in front of “Farola” de Málaga, just at the entrance to the beach from Muelle Uno. After nice and filling breakfast as well as long Friday night it is time to relax, sunbath and go swimming. This you can literally do just by going out from chiringuito and choosing the best place for your relaxation. You can rent a sun bed or just bring our own towel and beach umbrella. Be careful, don’t get sunburned especially If it your first time sunbathing during the season. It is always better to be safe than sorry so get your sun cream out of the bag! When the hunger starts entering again you do not need to worry to spend a long time searching for the place to eat. Check other chiringuitos which are located just along the coast. My personal favourite is Chiringuito Mami Beach. Get yourself to try for example few of these dishes: Roast Sardines (Espeto de Sardinas), Steamed Clams (Almejas Salteadas), Squid (Calamar), King prawns pil pil (langostinos al pil pil). I am sure you will be also thirsty after few hours on the beach. Be real Spanish person and order Summer Red Wine so called Tinto de Verano. It has a low amount of alcohol and it is served with ice. If you are not into having some alcohol ask the waiter if they have Mosto, typical grape juice of Spain. If you still haven’t got enough of the beach, of course, you can just go back and enjoy a few hours more there but I would recommend spending that time walking around Malaga. Go back to the center by passing by muelle uno, Paseo Maritimo or Paseo de Parque. 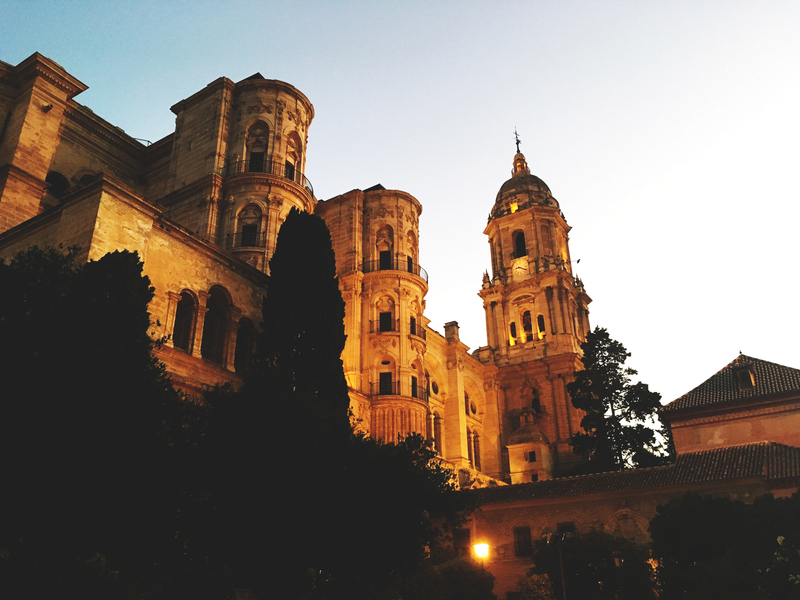 Check out the cathedral of Malaga. You can visit it and its rooftop buy paying 5 euros or you can get in just before or after the mass. Walk through main pedestrian street calle Marqués de Larios also called just Larios starting from plaza Maritima and finishing at Plaza de la Constitucion. Whole walking around Malaga you can also do some shopping. You can find well internationally known shops such as Mango, Stradivarius, Bershka as well as Spanish shops such as Pull & Bear, Mari Paz, Coolligan. In addition to this, close to the Cathedral you can find a lot of typical souvenir shops which for sure that can be useful to check when searching for symbolic gifts from Spain. Stop by and watch the amazing sunset from the best, at least for me, rooftop terrace of Malaga. Go back to the cathedral and visit the AC hotel Malaga Palacio terrace. Sometimes it might be hard to get in but trying your luck for a couple of times I am sure you will get in. It is completely worth it! See entire Malaga from different points. Malaqueta, muelle, two castles, cathedral and the entire center of Malaga will be just looking down for you. Grab a table, cup of coffee with a nice desert or a cocktail and enjoy an amazing sunset. To finish your Saturday, I would recommend to do it at the restaurant called L’experience. The Cathedral is literally in front of the restaurant allowing you to keep enjoying one of the most impressive buildings in Malaga. Try Spicy Bravas potatoes (Patatas Bravas), grab mixture of croquets (mixta de croquetas caseras), L’experience salad (ensalada L’experience), or Selection of Tapas 1. Get yourself white or red wine depending on your personal preferences and what you are going to eat. If you choose white wine and you like it to be a little bit sweeter ask for some kind of Verdeo and if you fancy red wine check one of the wines Ibericos. Start Sunday with breakfast which you can find only in Spain. Visit one of the most known places for such breakfast in Malaga at Aranda house (Casa Aranda). Order yourself a bunch of fresh hot churros with a cup of Chocolate or cup of coffee if you do not like the super sweet start of the day, and get a feeling of what is like to be Spanish. I am sure after such filling breakfast the only thing which you will like to do is to go to rest a little bit. However, there is no time for that! It is time to visit some museums and castles of Malaga. I would recommend visiting museum Revello de Toro which is just behind the cathedral. Check over 100 portraits and sketches of this famous painter of Malaga. Make sure that you see the last one which for me is the most impressive one it is called “Sumida en el sueño” (sleeping Sumida). After that start climbing to the castle of Gibralfaro. This could take some time and it could be exhausting so it is better that you take your time, bring some water with you and wear comfortable shoes. Stop ones in the while to enjoy an amazing view which starts to appear more and more ones you climb higher and higher. Ones you are in the castle go around it take a bunch of photos and start heading down since time is running! Walk to Alcazaba don’t miss any of part of it. This Moorish fortification I am sure will impress you! Here it is a great place to stop for a minute or two and enjoy the place and the view. While being in Malaga you just must visit the museum of Picasso and his house. See more than 200 works from his different collections visit the house where Picasso was living and get to know more about one of the best-known painters of all times. In between visiting different museums or after doing so I would suggest enjoying the typical food and music of Spain. Take a taxi or a bus and go to the “Baños del Carmen”. Order yourself a paella or in other words called Arroz Caldoso. Here you will have a couple of different options get yourself the one which you think you will like the most. Around 4 or 5 pm every Sunday here you can also enjoy some typical Spanish music and songs called flamenco. So relax, eat the paella and enjoy the culture of Spain. So hear you have your busy typical touristic weekend in Malaga. I hope you will give it a try if you haven’t visited those places already. For an extensive information about each place please check my other blog posts dedicated to each of them accordingly. Like always thank you for reading and don’t forget to comment/email your favourite places to visit in Malaga. Previous Grocery Shopping- Let’s Do It!